To be a well-rounded artist with as much information as possible at one’s disposal, I think it’s important get outside of one’s genre and see what else is out there. The classic piece of advice is to visit great museums and see masterpieces in the original and I agree with that. But, seeing a great painting and understanding what one can and maybe, should, learn from it are two different things. Today I’m going to present two works each from five great artists, none of whom are “animal artists”, although almost all of them included animals in their work at one time or another. I’m going to offer you a thought or two about how you might explore what I believe the artist has to offer. See what you can think of that uses the ideas in these paintings, but with animal subjects. 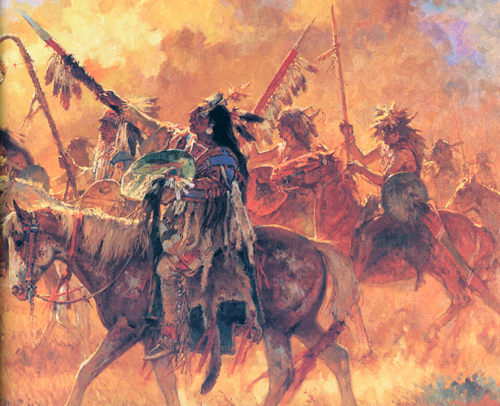 First is Roy Anderson, one of the great living painters of Native Americans. These images are from a book “Dream Spinner, The Art of Roy Anderson”, which I found at Settlers West Gallery in Tucson this past March for, can you believe it, $10. They may still have some. I don’t know if they will mail them out, but it can’t hurt to call and ask. At the back of the book is a whole section on how Mr. Anderson creates his paintings, worth more than twice the price of the book for the excellent advice and information he offers. Here is a master class in color and value relationships. 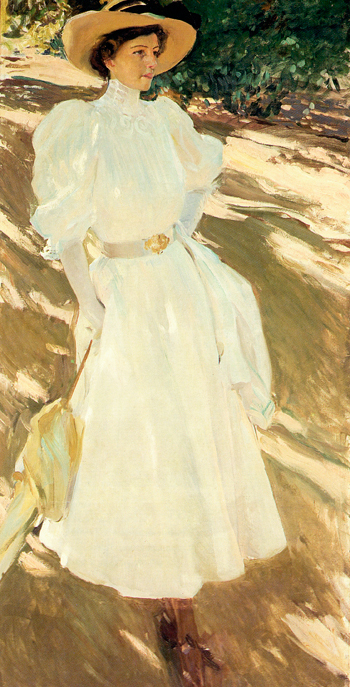 The painting has three “layers” from front to back. Imagine if this was a herd of wildebeest trudging through the dust of the Serengeti. This one is similar to the first Roy Anderson painting I saw and which just blew me away. I love the strength of the backgrounds. No fear of color here! How could one vignette an animal with this as an inspiration? 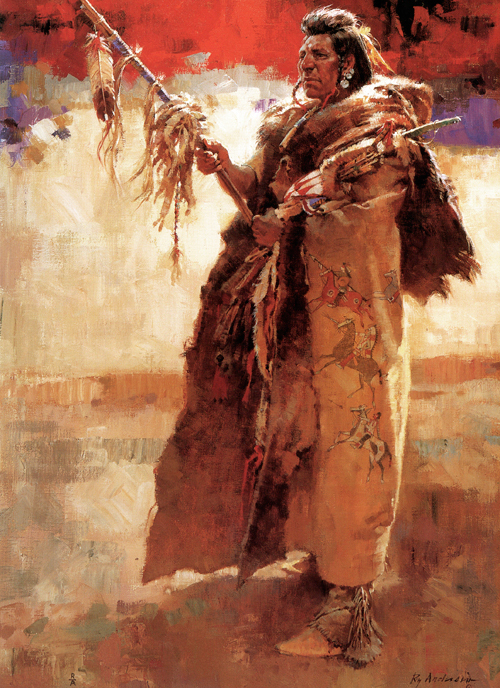 I must admit, though, that I’ve thought about how to present a Mongol herder in his traditional garb, using my own ideas of shapes and colors for the background. 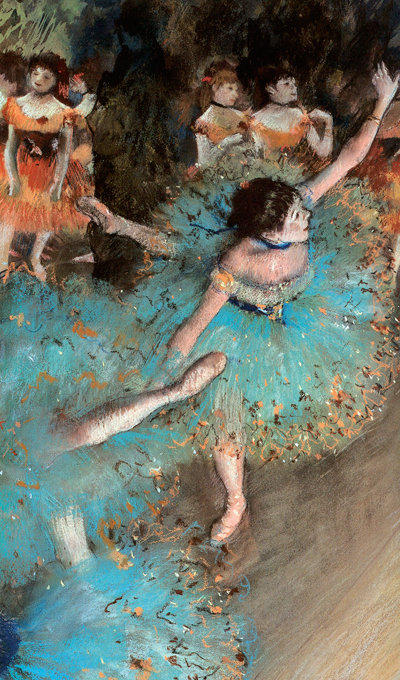 Second is Edgar Degas, who was equally accomplished in painting, pastel and sculpture. What inspires me personally about his work is his revolutionary compositions, in which figures and other elements are “cut-off’ by the edge of the canvas. 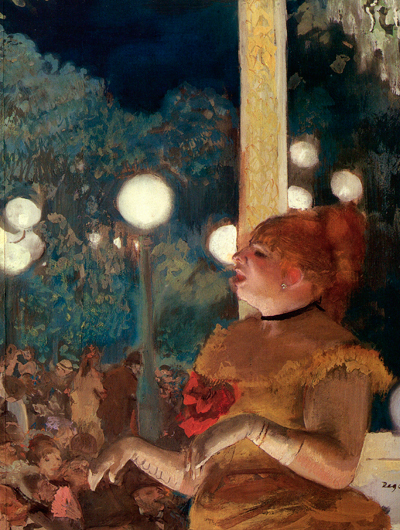 If you find your compositions getting a little stale or have realized that you tend to plop your subject in the middle of the canvas, looking through a book of Degas’ work will blast you loose. 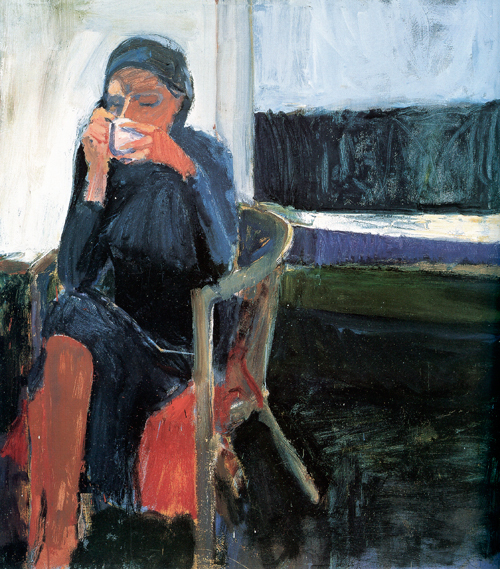 Third is Richard Diebenkorn, an abstract painter who scandalized his contemporaries in the 1950s by introducing recognizable figures into his work at a time when that was considered beyond the pale. How could this composition be adapted to an animal subject? Like Degas, Diebenkorn has used an unconventional placement of his subject, tight against the left edge and facing more or less off the canvas. All good painting has a solid abstract structure underneath. Robert Bateman, the legendary wildlife artist, started as an abstract painter and then applied that knowledge to his animal art. 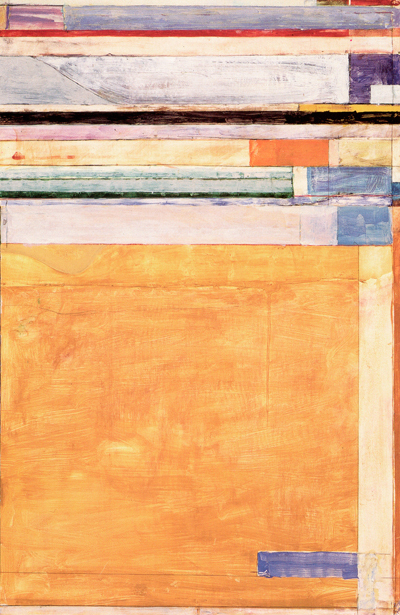 Here is a Diebenkorn abstract from the 1990s that could inspire a representational composition. 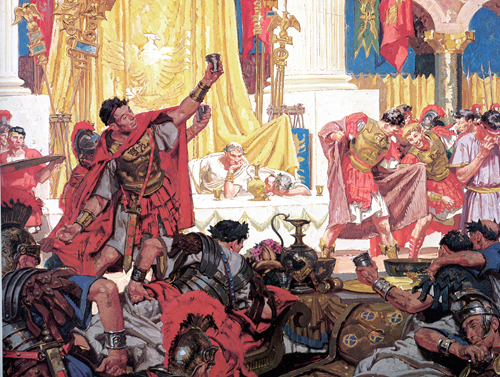 Fourth is Dean Cornwell, known as the Dean of American Illustrators. He trained in mural painting with Frank Brangwyn in England and it shows in his ability to put together panoramic images with lots going on. The inspiration in this piece is having the foreground and even the main character in shadow, contrasted with the bright, colorful background. 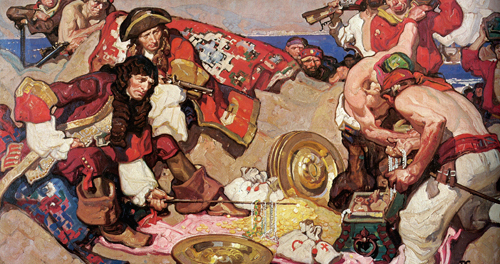 Cornwell’s rich, decorative approach and fantastic draftsmanship have something to offer artists in any genre. 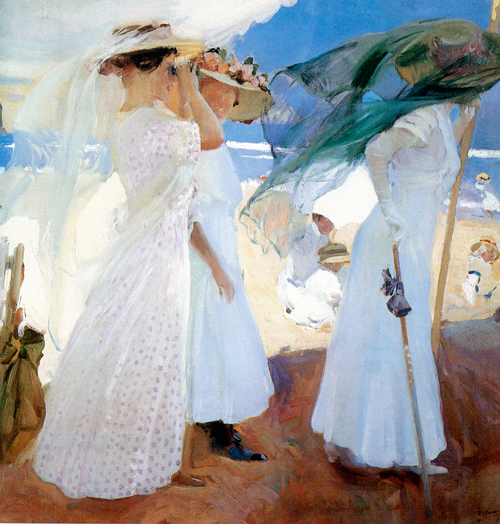 Fifth is Joaquin Sorolla, known for his incredible ability to paint light. It’s easy to get caught up in what is called “local color”, the inherent color of a subject. This and the next painting illustrate the truth that the color of something depends on the light (and also what the object is next to). We accept that the three ladies in the foreground are wearing white, but there is not a speck of pure white paint on any of their dresses. How many colors can you count in this “white” dress?